a flexible design flow environment. The combination of the laser diode and photonic integrated circuit design capability allows you to characterise any laser diode geometry and model photonic circuits that include both passive and active components. As a design flow tool, PICWave allows you to design PICs using pre-defined design kits provided by our industrial partners. Once your circuit is assembled you can simulate it in PICWave before submitting it to the fab for manufacture. PICWave includes a detailed active model allowing the simulation of various types of SOAs (amplifiers) and laser diodes, including Fabry Perot lasers, hybrid silicon lasers, DFB lasers, tuneable lasers, ring lasers etc. It can also model modulators and photo-detectors. 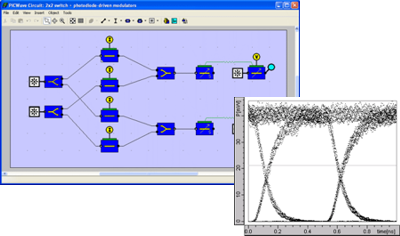 PICWave overlaps the laser model with an optical circuit and electric circuit simulator. PICWave is able to import gain models directly from our hetero-structure model Harold. Its unique Wide-Band Gain Fitting algorithm allows you to get accurate results over a broad range of wavelengths; very useful when modelling SOAs as part of more complex active photonic circuits! You can also import QCSE EAM models generated with Harold EAM. PICWave can model advanced physical effects such carrier diffusion, current spreading, longitudinal and lateral hole burning. This allows it to model complex devices such as hybrid silicon lasers. You can find the detail of PICWave's active modelling capabilities here. PICWave's circuit simulator is ideal for studying the interaction of multiple optical components in a larger circuit. A circuit simulator allows you to model optical propagation in complex and large devices, that can be even metres in length, and therefore out of reach of traditional Maxwell solvers such as FDTD or FEM. It can for example model a 2mm diameter ring resonator in a very short time to resolutions of a few MHz in optical frequency. PICWave's time-domain model allows it to combine active and passive circuit elements, which can include waveguide components (MMIs, Y-junctions, tapers etc. ), DBR gratings, SOAs, modulators (QCSE and silicon), photodiodes, RLC circuits etc. PICWave also features a χ(2) non-linear model for designing periodically-poled nonlinear sections such as PPLN. PICWave is fully integrated with FIMMPROP, our flagship passive component model. It can import rigorous passive component models (S-matrix spectra) from FIMMPROP and include them within a larger photonic circuit. The combination of the component level and circuit level simulators makes it possible to modify the geometry of a passive component and even to couple passive components together within your circuit model. You can find the detail of PICWave's circuit modelling capabilities here. PICWave allows you to import design kit libraries provided by industrial fabs, allowing you to create photonic circuits simply by assembling pre-designed and pre-tested components. You can then simulate and test your designs before submitting them to the fab for manufacture. You can also create your own building block libraries of fully parameterised FIMMPROP components within PICWave. These can then be used to construct and simulate PICs in PICWave, even by designers with little or no FIMMPROP experience. Note: PICWave supersedes Photon Design's laser diode modelling tool i-CLADISS which is now obsolete.